Amazing vocal acrobats and perennial Freight favorites, The Bobs – Matthew Bob Stull, Richard Bob Greene, Dan Bob Schumacher, and Angie Bob Doctor – serve up unforgettable performances, outrageous covers of classic songs, and wonderful, witty originals. In shows that are part pop music, part comedy, and part performance art, this a cappella “band without instruments” uses voices and body percussion to make music that is hilarious, inspiring, and often beautiful. 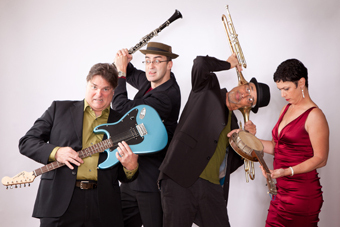 If you haven’t seen them before, think Manhattan Transfer meets Monty Python. Or imagine Jimi Hendrix and George Gershwin jamming with Karl and Groucho Marx. Formed in the Bay Area in 1981, The Bobs have played everywhere from Lincoln Center to Berlin's Passionkirche, earned four Grammy nominations, and won just about every a cappella award there is to win. They’ve recorded 16 albums, including their brand new one, Biographies, a collection of originals in the inimitable Bobs style. Each song tells the story of a life, some already famous, some – until now – obscure. Get the lowdown on Lord Buckley, Lorenzo da Ponte, Valentina Tereshkova, Clarence Birdseye, and more! To say that The Bobs have a good sense of humor is a little like saying that LeBron James has a decent move to the hoop. The funny thing is, they’re brilliant musicians – who just happen to be certifiable. In the words of comic Paul Provenza, “Some performers are brilliant comedians, some are genius musicians, and some just make you happy to be alive. The Bobs are all of that – and then some.” If you’ve seen them before, you know how much fun this show will be. If you haven’t seen them yet, check ’em out!